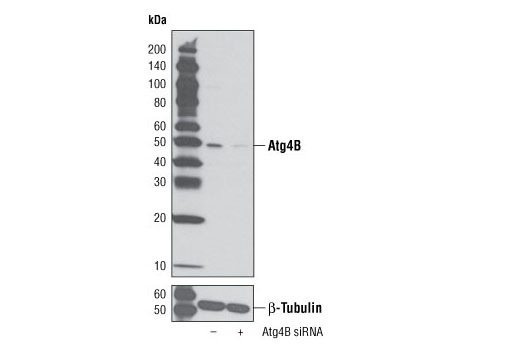 Western blot analysis of extracts from various cell lines using Atg4B Antibody. 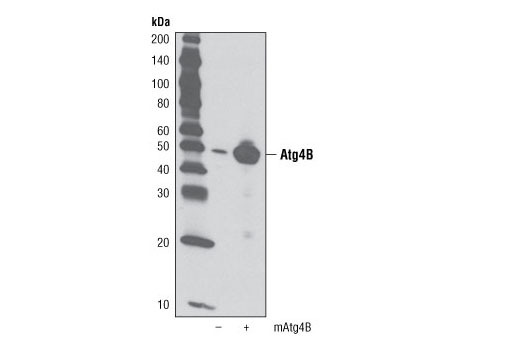 Western blot analysis of extracts from 293T cells, mock transfected (-) or transfected with mouse Atg4B (+), using Atg4B Antibody. 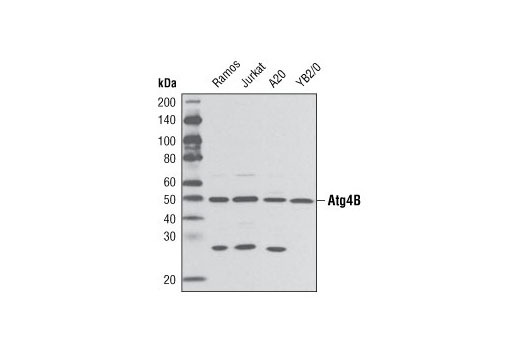 Atg4B Antibody detects endogenous levels of total Atg4B protein. This antibody detects a band at ~27 kDa of unknown origin. Polyclonal antibodies are produced by immunizing animals with a synthetic peptide corresponding to residues surrounding Ser372 of human Atg4B protein. Antibodies are purified by protein A and peptide affinity chromatography. While Atg4B displays a broad specificity for Atg8 homologues, it preferentially cleaves LC3 (7-9). Mutation in the corresponding Atg4B gene can be associated with strong inhibition of autophagosome formation. An excess of inactive Atg4B blocks lipidation of Atg8 homologues and inhibits autophagy. This makes Atg4B a potential tool for characterization of the isolation membrane and other autophagy studies (10,11). Tanida, I. et al. (2004) J Biol Chem 279, 36268-76. Hemelaar, J. et al. (2003) J Biol Chem 278, 51841-50. Fujita, N. et al. (2008) Mol Biol Cell 19, 4651-9. Fujita, N. et al. (2009) Autophagy 5, 88-9.